JACKSONVILLE, Fla. (AP) — The Jacksonville Jaguars are returning to the playoffs for the first time in a decade thanks to a 45-7 drubbing of rival Houston on Sunday. 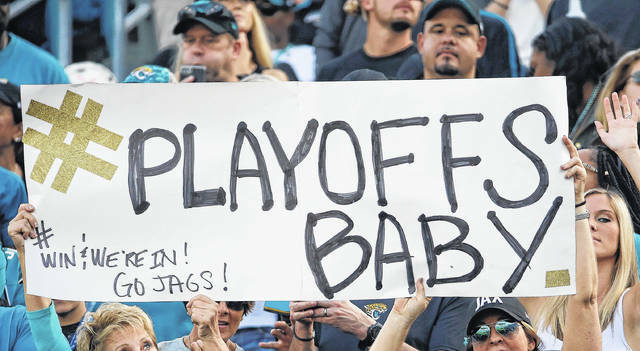 Once the NFL’s poster child for futility and a punchline for potential relocation, the Jaguars (10-4) are now one of the league’s top turnaround stories. PITTSBURGH (AP) — Tom Brady fed Rob Gronkowski repeatedly to set up Dion Lewis’ go-ahead 8-yard touchdown with 56 seconds remaining and Ben Roethlisberger was intercepted in the end zone with 5 seconds left. SEATTLE (AP) — Todd Gurley rushed for 152 yards and scored four total touchdowns in just 2½ quarters, and the Rams moved to the cusp of their first division title since 2003. SANTA CLARA, Calif. (AP) — Jimmy Garoppolo led one final scoring drive in the closing seconds to cap a fantastic first home start and Robbie Gould kicked a winning 45-yard field goal as time expired. Garoppolo threw for a career-high 381 yards and a touchdown to give the 49ers (4-10) a three-game winning streak in a lost season. And Tom Brady’s former backup showed he could do it at home as well as on the road — and against a playoff contender, no less — outdueling Marcus Mariota down the stretch as the teams traded field goals. EAST RUTHERFORD, N.J. (AP) — Nick Foles threw four touchdown passes in his first start replacing the injured Carson Wentz, and the Eagles secured a first-round playoff bye. CHARLOTTE, N.C. (AP) — Cam Newton threw for 242 yards and four touchdowns, and the Panthers spoiled Aaron Rodgers’ return from a broken collarbone. NEW ORLEANS (AP) — Mark Ingram ran for two touchdowns and gained 151 yards from scrimmage, including a late 50-yard TD run, and the Saints overcame three turnovers. Bryce Petty made his first start at quarterback this season for the Jets (5-9), who were eliminated from playoff contention. Petty completed 19 of 39 passes for 179 yards and a touchdown, but was intercepted twice — once on a tipped pass and once on a long, inconsequential throw as the game ended. ORCHARD PARK, N.Y. (AP) — LeSean McCoy scored twice and surpassed 10,000 career yards rushing, while helping the Bills stay in the thick of the AFC playoff hunt. Tyrod Taylor also scored on a 9-yard touchdown run and Shareece Wright and Jordan Poyer intercepted Miami’s Jay Cutler on consecutive drives to start the second half. Buffalo never trailed. Rookie Tre’Davious White sealed the win by intercepting Cutler with 28 seconds remaining — and one play after Miami punter Matt Haack recovered an onside kick at Miami’s 37. LANDOVER, Md. (AP) — Anthony Lanier sacked Blaine Gabbert and forced a fumble that Preston Smith recovered and the Redskins held on to beat the Cardinals in a comedy of errors for each team.